For a country steeped in a rich tea tradition (get it? tea? steep? ha ha ha), Japan has a lot of really pimpin’ coffee-making stuff. It is still not that easy to find super delicious coffee (don’t mean to be a snob about it, but it kind of comes with the territory when you live in Portland, OR), but that’s okay (we did go to a really awesome roastery/cafe in Toyama). Anyway, I sort of thought my head was going to explode when I came across the coffee section at Tokyu Hands, but I took a few deep breaths and just got a couple of useful-to-me items. Both are for making single servings of pour-over coffee. 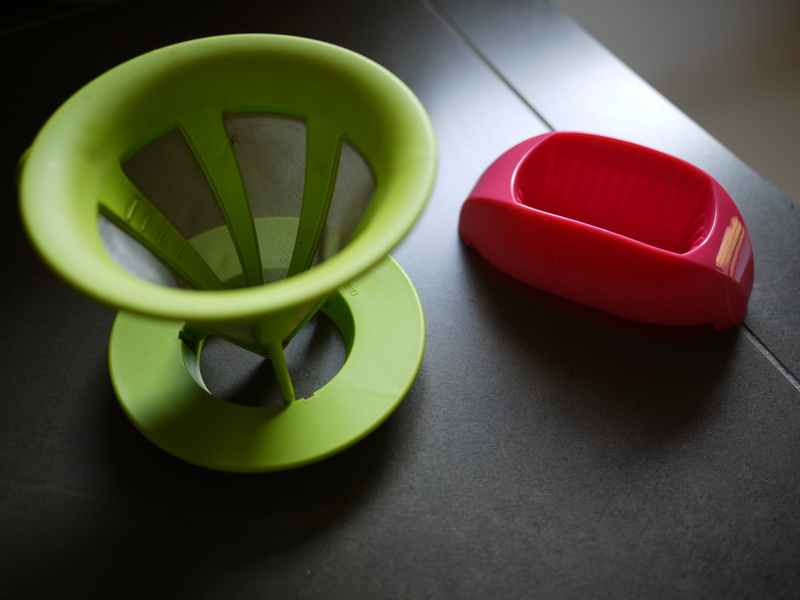 The lime one is great, because you don’t need to use paper filters! You do need paper filters with the pink one, but look how cute and tiny and portable it is. I figure it will be good for camping or something. I did have a bit of an accident with it when I got a little overzealous with the water pouring (collapsing wet filter and grounds), but it works great if you exercise some restraint. This entry was posted in Uncategorized and tagged coffee, coffee filters, japanese coffee. Bookmark the permalink. fyi: if you have a groundsplosion? you can always filter it back through to remove them.